"You can't stop at just one!" So, how did we get into this? Well, it's kind of a long story. Here's the short version. About 20 yrs. ago, our daughter's boyfriend asked us to "cat sit" for his friend's pair of "American Hard Ear" cats. Well, they weren't American Hard Ears. They were American Curls with straight ears. And "temporary" became permanent. This initial accidental experience with Curls (or was it a divine direction??? you decide after reading our story) produced an admiration for this fascinating breed. 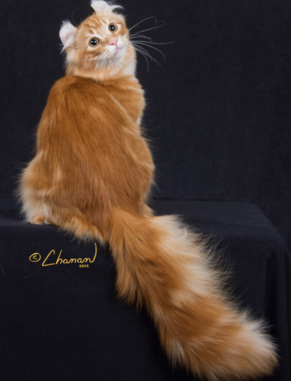 We purchased our first breeding cats with the condition that we would show the cats in CFA at cat shows. We had never seen a cat show... we didn't even know there was such a thing. We were really "dog people"...not "cat people"
At first, Mike only went as the 'dutiful husband' who tags along to help his wife... and only on weekends that didn't have an important football game on TV. But then, at one of the shows, one of our boys started winning... a lot! Mike's competitive genes kicked in and he was hooked too. That was our first grand Champion boy, Curl Essence Cinnamon. ("Cinns" is now in Brazil populating that country with pretty little red American Curls... and we couldn't be prouder of him if he was the first male child in our family to get a Masters Degree). "Cinns" is shown on our Champion Hall page . He's also in the photo to the right. (ok, so now's the time you comment to yourself "what a pretty boy!" We still do whenever we look at these photos of him when he first granded. ("Granded" means he earned his title as a Grand Champion in CFA.) Cinns always had a great temperament which he passed on to all his offspring. We continually comment to each other about the great temperaments of our red cats. It all seems to stem back to this pretty boy. ​We continued to show in CFA, and now, we also show in TICA (The International Cat Association). We have cats as pets and as show cats around the world. We love to hear from our new Curl owners with stories about how they've changed their lives. Some of the stories are on our Testimonial Page our visitors. We can go on and on about how we "socialize" our kittens so they fit into their new families, but we would rather you read about it from the people who have our kitties. We love spending the day with our cats at cat shows. However, we've come to realize that not all kitties are what we call "show-able"... not because they don't have great features, but some just don't have the personality for it. They don't like the noise and activity, and they don't like strangers handling them. They love their humans, but they don't enjoy the strange environment and activity. It can be scary to them. On the other hand, there's cats like Cinnamon, Handy, Kingsley who LOVE the attention. They get to spend the entire day with their humans without having to share us with the other cats in the house. We used to laugh at Handy at the shows... it was like he KNEW he was pretty. He would actually pose for spectators at the shows so they could compliment him on how pretty he was. He was a really fun cat to grand. Then there's Storm... OMG! He LOVED, LOVED, LOVED the shows. He recognized the pre-show activity of grooming and packing for the show. He would get visually excited in anticipation. We would always ask to be benched right by the front door so he could people-watch. He loved playing with the judges, and he loved it when spectators would stop by and play with him or just admire him. You may think they don't notice, but they do. From our first days in the show halls, we became aware of how few people knew about the American Curl and what a great family pet they are even though the breed was 25-30 years old. So we decided to make it our mission to educate the public about breed. We have been blessed with the unique access to the founders of the breed as our mentors. We had gone from two people who knew little to nothing about the American Curl to CFA Breed Council Secretary (Mike) and 1 of 3 Breed Committee Members for TICA (Linda). Over the years, we have helped new breeders around the world as mentors with their breeding programs and for showing their Curls. As Breed Council Secretary for CFA, Mike has initiated several vital revisions to the CFA American Curl Standard. In 2015, we created the CFA "Breed Presentation", a 64 page full color power point presentation which is sent to all CFA judges and is also posted on the www.CFA.org website as a constant reference instructing judges on how to evaluate every feature of our breed. Mike also worked with Grace Ruga at the World Cat Congress in Las Vegas in 2017 to put on a Breed Presentation to judges from all the different feline associations. The Breed Council Secretary is "the voice" for the breed in CFA. Linda is on the TICA Breed Committee with Joe and Grace Ruga. Realizing how little training is available to breeders around the world, Linda created a separate website at www.theamericancurlstandard.com to help breeders (and judges) how to interpret the AC Standards for TICA, CFA, FiFe and ACLA. We firmly believe that the American Curl makes the very best feline pet, and it's our goal to convince an unsuspecting public that we're right.